This new and innovative book combines literature, music, and movement to teach young children the joy and excitement of music, physical education, and reading. All lessons are based on the national music and physical education standards. Over 170 lesson plans are included. Each lesson has a story for the teacher to read to the children, a music activity and a physical activity. Lessons include basic music and physical education skills as well as lessons that teach students about staying healthy, good character, citizenship, holidays, and world cultures. Each lesson takes approximately forty-five minutes per day to complete. Lessons in Units 1 and 4 are sequential. Other lessons can be taught in the order that hey appear or can be flexible depending upon the school calendar. A resource list of all literature, equipment, and songs needed is provided. All songs, books, and equipment are very accessible. Adaptations for regular classroom teachers and assisting paraprofessionals are described. Finally I get this ebook, thanks for all these Singin’, Sweatin’, and Storytime I can get now! Singin’, Sweatin’, and Storytime was the best books I ever buy. Singin’, Sweatin’, and Storytime did exactly what you said it does. I will recommend you to my colleagues. 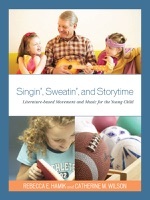 Singin’, Sweatin’, and Storytime is the most valuable books we have EVER purchased. I'd be lost without this. I am completely blown away.